Add a subtle blush hue to your look with this MOMENTS sterling silver charm bracelet with a PANDORA Rose clasp. The clasp is not only filled with sweet sentiments but also embossed with the PANDORA logo and radiates with its pink hue, created from an unique blend of metals. It’s the perfect gift for someone about to start their PANDORA collection. Available online and in-store. PANDORA MOMENTS Silver Bracelet with PANDORA Rose Heart Clasp is rated 4.1 out of 5 by 58. Rated 3 out of 5 by JulieTX from Very pretty but rose gold plating rubs off <1 year I bought the bracelet in December 2017 and loved that they came in smaller sizes for small wrists; it was beautiful with a true rose gold tone color however the heart now looks like the center plating/vermeil, whatever it is, on both sides has rubbed off and shows a dark gray color as if it's tarnished (but isn't because I had it cleaned and if you look very closely it looks like it peeled off as there are visible 'edges'). Wish it had lasted longer and thought Pandora quality was better than that but it's probably only affected by the pandora rose line. Rated 2 out of 5 by Raeraee from Looks nice but... I received this Pandora bracelet for Valentine's Day and after three months of never taking it off I realize that the rose gold part was starting to lose its paint revealing an metal underneath. the clasp is much bigger than it looks and quite heavy so it always rotated itself to the bottom of my wrist, there for, bumping into things constantly which caused the Rose gold layer to come off. I'm very upset because my bracelet is only three months old and it looks worn out. Rated 5 out of 5 by Sharon7 from Wonderful present Got this from my boyfriend for my birthday. Very sturdy. Looks beautiful with and without charms. 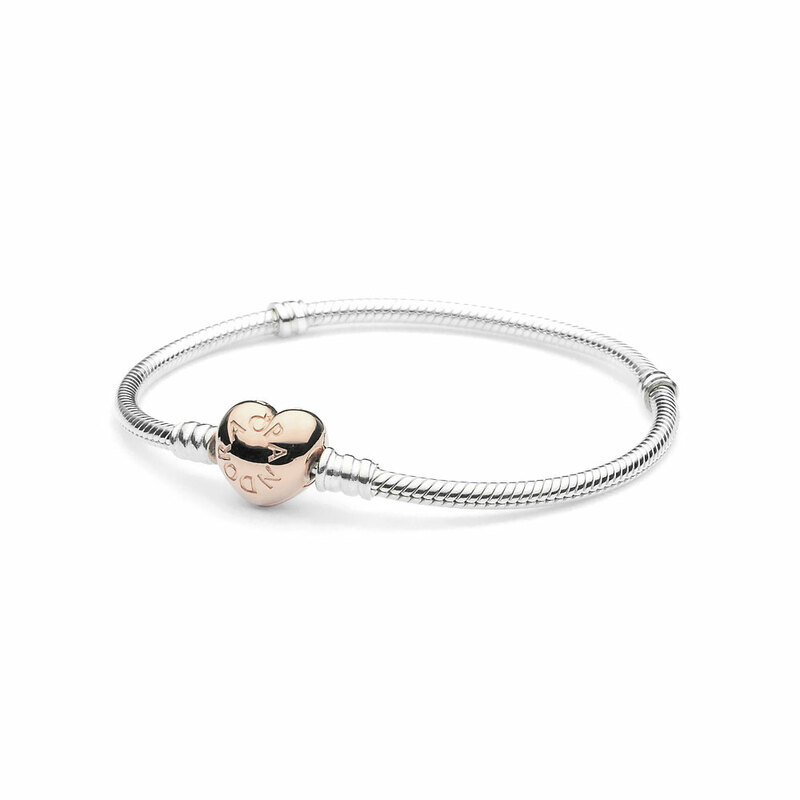 Looks like the original pandora bracelet but with a rose gold colored heart. Ok..this review was biased.. but totally worth it! Rated 5 out of 5 by Wilmie from Words Can't explain Much more beautiful in person. I wear it everyday. My boyfriend does love me lol. One of my favorite gifts. The rose gold adds the touch that makes other color charms pop. Im so love I cant keep my eyes off it. Rated 2 out of 5 by Shannon0110 from Tarnished Bracelet arrived tarnished and didn't look great. Was looking forward to the beautiful bracelet in the picture. Rated 5 out of 5 by pinkyc31 from Beautifully made My sister gifted me this for Christmas and I absolutely love it!!! I have been obsessed with adding charms since I received it. I read some reviews that said the clasp won’t close but I don’t have that problem. It’s very secure but I’ve only had it for a few weeks. Also, I have not experienced any tarnishing as of yet. I love my bracelet! If anyone is concerned about the possibility of tarnishing just purchase the silver one. However, I think the rose gold adds a more elegant touch. Rated 5 out of 5 by Sonya 31 from My favorite I got for Valentine’s Day my husband pick it with no help .Im truly in love with this one..